More and more, how businesses sell to consumers influences how businesses sell to each other. Expectations are changing. Modern businesses need a commerce platform that continues to push the bounds of retail innovation and delivers B2B functionality that meets consumer-influenced expectations. That platform is Mozu. While B2B standards are rapidly changing based on B2C influences, there are certain bedrock items that every B2B seller needs in a commerce platform. Mozu provides these foundational elements and more. Incentivize your best customers with special pricing, defining multiple price lists and assigning customers to those lists. Set spending limits, net payment terms and controls, keeping your business streamlined and customers happy and in-the-know on payment obligations. Define who should be allowed to perform what actions or see what products and content on your site by outlining the structure of your customers’ business. "Mozu's new B2B features will allow our brands to provide incentive-based programs to our customers, encourage larger sales volumes, and attract wholesale accounts." Looking To Simplify Enterprise Commerce? 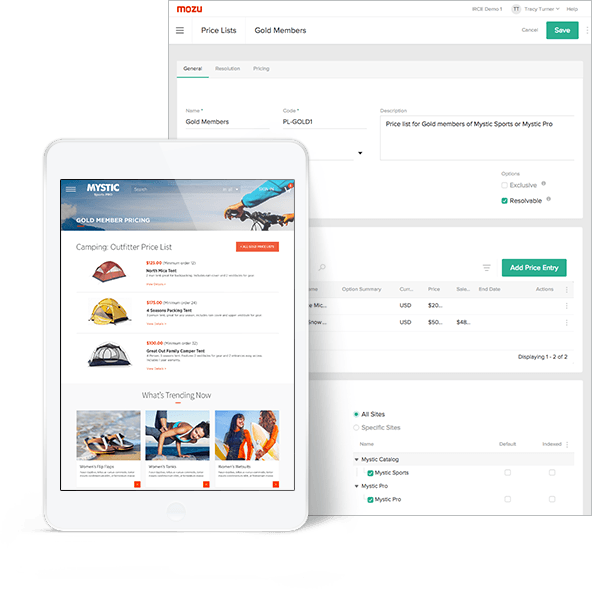 Request a custom demo from our commerce experts or call us at 1-800-965-5040 to see what Mozu can do for your business. Thank you for contacting Mozu. We will be in touch shortly.